1.6 How to Apply for tspsc.gov.in Paramedical Staff Recruitment 2017? Good News!!! Telangana Public Service Commission has recently notified an Employment Notification for the recruitment of 1261 Staff Nurse, Radiographer, Health Supervisor, and other Posts. These vacancies are to be filled in Health Medical & Family Welfare Department, Social Welfare Degree Colleges, and Insurance Medical Service of Telangana. So, Eligible candidates can apply online to this Latest TSPSC Notification 2017 from 16th November 2017 onwards. This is the best chance for the people who are looking to start their career with Telangana Government Jobs. What are you waiting for? this is the right time to utilize this golden opportunity. So, hurry up and be the first person to apply for TSPSC Staff Nurse Recruitment 2017. But before going to apply for the Staff Nurse Vacancy in Telangana, aspirants have to make sure the eligibility criteria first. Aspirants who fulfil the eligibility criteria and wish to be a part of this organization can submit the applications in online mode only. The online application link for TSPSC HMFW Recruitment 2017 will be active from 16th November 2017. The officials have mentioned that 11th December 2017 is the last date to apply for Staff Nurse Govt Jobs in Telangana. Take a look at the following sections for more details of TS Staff Nurse Recruitment 2017. Individuals who are thinking to apply for this TSPSC Staff Nurse Recruitment 2017 must ensure themselves that they have met the eligibility criteria or not. If you have not met with the given criteria then don’t apply. Because it is the complete waste of time and money. So, check the eligibility conditions of Telangana Health Department Recruitment 2017 from this section. Aspirants must have passed 10th Class /Diploma /Graduation in the relevant discipline from a recognized University or Institution. To know post wise qualification details, refer the official notification. The age limit required for TSPSC Paramedical Staff Recruitment 2017 is not yet declared. The officials will soon declare the age limit for www.tspsc.gov.in 2017 Staff Nurse jobs. But candidates belonging to reserved categories will get age relaxation as per the rules. Simply applying within the deadline doesn’t get your desired job in Telangana Health & Family Welfare Department, you have to study well for the written exams and you have to attempt a number of questions with a good accuracy. If you do all these things after the application process then you can get a hope that you can grab this job. But you may not have an idea about where to find the study materials and previous year questions papers for the written test. Don’t worry; you can get all those stuff from our site. Contenders can check the other details of Telangana Health Department Recruitment 2017 such as selection process, application process, exam dates, and others in the below section. So, make a move to the following sections and get the useful information about TSPSC Staff Nurse Notification 2017. Applicants of TSPSC Paramedical Staff Recruitment 2017 will be selected based on their performance in the following rounds. Candidates have to pay an application fee of Rs. 200 in online mode. One should make fee payment before the given deadline. 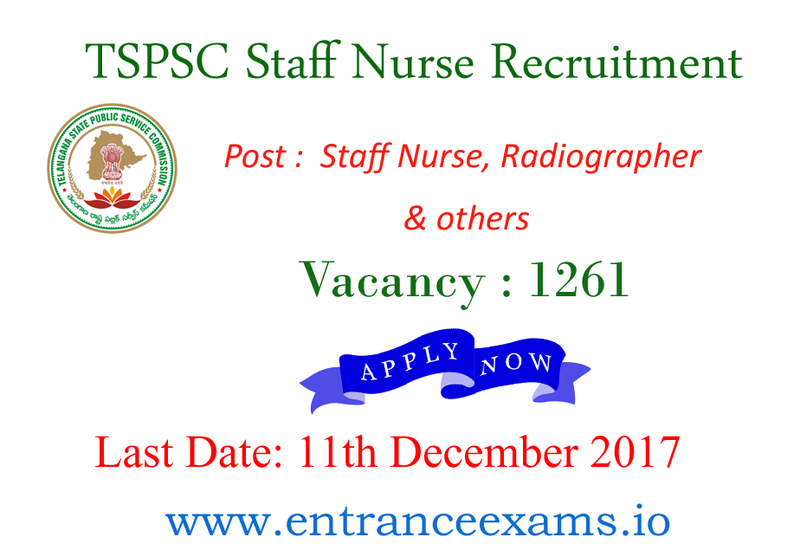 TSPSC Staff Nurse Notification release date: 8th November 2017. Starting date to apply online for Staff Nurse Vacancy in Telangana: 16th November 2017. End date to submit TS HM & FW Application form: 11th December 2017. TSPSC Health Department Exam date: intimate soon. How to Apply for tspsc.gov.in Paramedical Staff Recruitment 2017? Firstly Log on to the official website of Telangana PSC i.e, www.tspsc.gov.in or else click the direct link attached below. Then click on Notifications section appearing on the homepage. Now Find the relevant link of TSPSC Notification 2017 and go through it. If eligible, click on the apply online link of TSPSC Staff Nurse Recruitment 2017. Fill the required details with valid data as per the instructions. Upload the scanned copies of the recent photograph, signature, certificates as per the prescribed format. Crosscheck the details once and click the submit button. Finally, take a printout of the filled TSPSC HMFW Online Application form for further reference. Hope you get the complete details of the Telangana PSC Staff Nurse Recruitment 2017. Also, check TSPSC Upcoming Notifications 2017 from this page. If you are willing to find out more TS Govt Jobs and other Government Jobs in India, then, check them all on our entranceexams.io site.